It's available to preview and buy from the link below. I would love for you to take a look and to share it with your circles to help me spread the word. See my blog Signature series for the latest news on John Fields exhibition at Gus Fisher Gallery, Auckland, 2 June-11 July 2015. I am adding to this so check out recent additions. 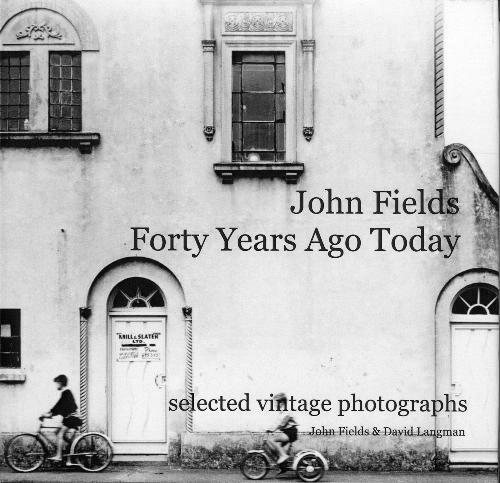 See my lavish book published to mark the exhibition featuring John Fields' Signature series. Since 1998 I have had the rare opportunity and pleasure to handle a range of exquisite vintage archival silver gelatin photographs, hand-made by U.S. born photographer John Fields throughout his career. Be one of a select group of buyers who have invested in these collectable works by one of New Zealand's foremost photographers. Galerie Langman has sold many works s to national museum Te Papa Tongarewa Museum of New Zealand in that time. Other public galleries include Auckland Art Gallery and Wanganui's Sarjeant Gallery. John's work is also represented in important corporate collections. Read more about John here and examples of sold works here. We have published an 80 page book about John. Contact us below for copies ($80.00 plus postage+ packaging). Alternatively you can go to www.blurb.com to buy direct. Also on display* in our web catalogue are panoramic photos from Allan Chawner's Ceilings, World Towns and other series, and works by David Langman. These superb original images are made available in a wide range of print sizes to add style and atmosphere to homes, apartments & corporate offices. *All works are copyright the artists. Reproduction is expressly forbidden without the written approval from the artist.